Tilapia are mainly freshwater fish found in shallow streams, ponds, rivers and lakes. Tilapia were one of the three main types of fish caught in Biblical times from the Sea of Galilee. Tilapia have very low levels of mercury,as they are fast-growing, lean and short-lived, with a primarily vegetarian diet, so do not accumulate mercury found in prey. Tilapia are low in saturated fat, calories, carbohydrates and sodium, and are a good protein source. They also contain vitamin B-12 and trace minerals such as phosphorus, niacin, selenium, and potassium. Black pepper adds more than just flavor, it is also good for digestion. Spinach is a cruciferous vegetable, and 4 servings a week of this class of vegetable helps ward off cancer causing cells. As a side note, this recipe is great nutritional support for those who suffer with Schizophrenia (Read More Here: Nutritional Hope for Schizophrenic Patients). Cook spinach in large saucepan on low heat until just wilted. Drain and cool. Squeeze excess liquid from spinach; chop finely. Combine spinach and feta in medium bowl. Cut lengthwise pocket down 1 side of each cut Tilapia, being careful not to cut through. Pack 1/3 cup spinach mixture into each pocket. Sprinkle with salt and pepper. Bake in heated oven for 12 to 15 minutes or until done. 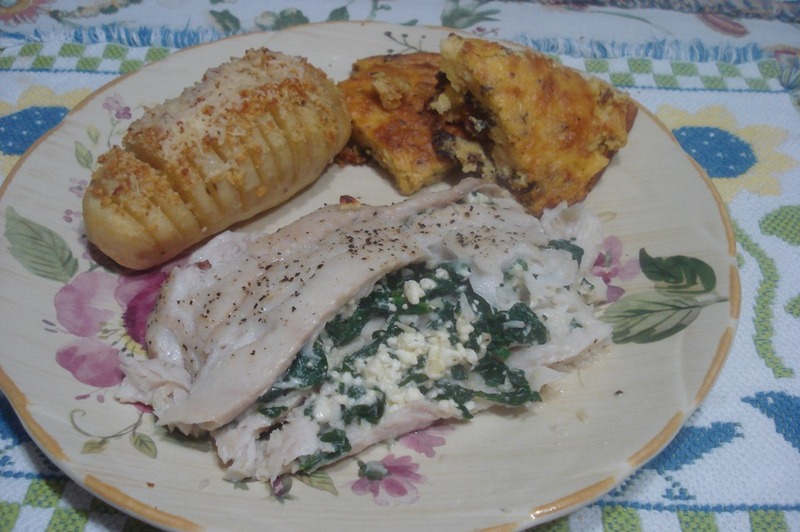 Plate and serve with your favorite side dish, such as we have here with a Bacon Cornbread or Baked Parmesan Potato. Want to learn how to cook fish in under five minutes? This entry was posted in Fish, Main Dish and tagged Arnold Schwarzenegger, Avocado, Baba ghanoush, Bake, Black pepper, Casserole, Christmas, Clove, Cook, Cookware and bakeware, Cornbread, Feta, Food, Fruit and Vegetable, Health, Lasagne, Olive oil, Parsley, Potato, Salmon, Schizophrenia, Sea of Galilee, Spinach, Tablespoon, Tilapia, Vegetarianism. Bookmark the permalink. 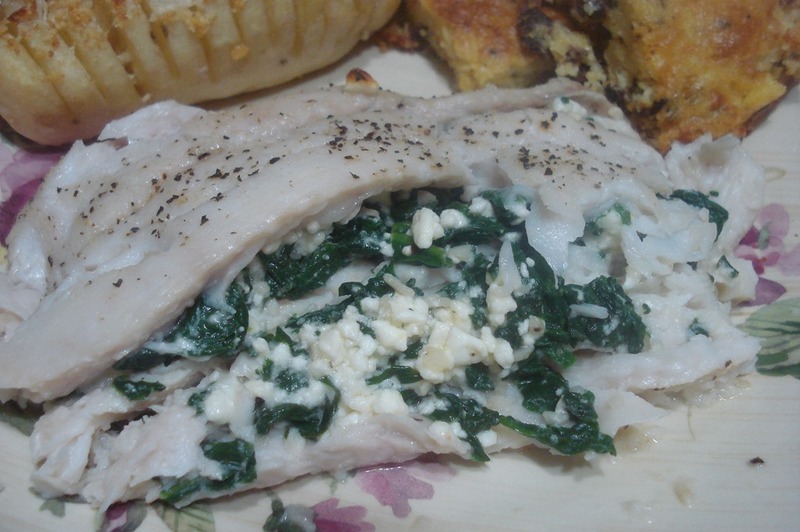 I like fish and chicken with spinach stuffing – very tasty. Thank you for the link to my post. Your welcome Jovina. Personally I favor chicken, but my wife loves fish with spinach.